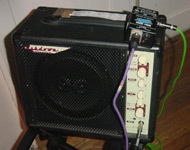 We have our own PA system whch we can bring with us. However, if you're supplying the PA, this is what we need. There are five of us in the band. Eric requires a stool or a chair without arms, while the rest of us stand. We require at least two foldback monitors, with separate mixes. We need mains supply for pedals and amps at both the front (mostly) and back of the stage. 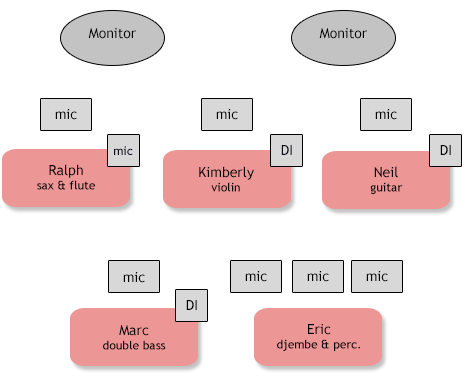 We're an acoustic band, not a drums-and-guitar rock band, so the PA needs to be configured and operated accordingly. If we're providing the PA then all we require is a 13 Amp mains socket within reasonable distance of the performance area — we don't want the audience tripping over extension leads (as they invariably miss the beat).